Lasem is a small village near Haraz Road in Mazandaran Province, it is a cosey place for acclimatization and exercise before attempting ski mountaineering in winter on Damavand Iran. There are only local houses for accommodation in this area. 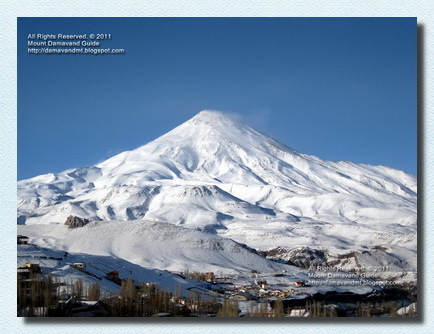 Damavand Ski touring and snowboard expedition. Hiking & trekking and climbing tours. Lasem climbing/ski touring. Shemshak cross country skiing adventure tours. Ski and snowboarding tours. Tehran ski and snowboard federation resorts. Lasem is a small village near Haraz Road in Mazandaran Province, it is a cosey place for acclimatization and exercise before attempting Ski Mountaineering Damavand Iran. There are only few local houses for accommodation in Lasem Ski Resort. Please note Lasem is a remote village in winter and there is not any restaurant or proper place such as hotel, hostel, refuge, lodge, shelter .... for accommodation in Lasem, it is highly recommended to reserve and book your room in advance or use the Polour Hut as your resting place. Polour Lodge is a very comfortable hostel. - Remember Damavand Weather Condition condition could change to disastrous in winter, with strong winds up to 100km/h and freezing temprature reaching -60°C at the summit, you must be well-experienced for such a difficult climb or ski mountaineering expeditions in harsh climate on Damavand, and further more remember that rescue and medical facilities are not available in case of injury and emergency you need a good luck for surviving, so extra care should be taken for climbing and ski in winter and it is done by your own risk. - In bad weather and stormy situation, poor visibility or darkness, it is not safe to go to the area without a reliable navigation unit like a handheld GPS receiver. Lasem Skitouren und Snowboard-Expedition. Lasem Trekking und Skitouren. Lasem Wander-und Snowboard-Expedition Tour. Skitouren Iran. Langlauf-Abenteuer-Touren. Ski und Snowboard Verband Iran. Damavand Route und Wanderkarte. Skifahren Abenteuer-Tour Expedition. Skitouren und Skitouren Gespräche und Diskussionen. Ski Alborz Mountains Iran. Ski-Expedition Tour Iran Bergzone. Skitouren Alborz und Zagros-Gebirge. Lasem ski touring and snowboard expedition. Lasem trekking and ski touring. Lasem hiking and snowboard expedition tour. Ski mountaineering Iran. Cross country skiing adventure tours. Ski and snowboard federation Iran. Damavand route and trail map. Downhill skiing adventure tour expedition. Ski touring and ski mountaineering talks and discussion. Ski Alborz Mountains Iran. Ski expedition tour Iran mountain zone. Ski mountaineering Alborz and Zagros Mountains. Useful links Damavand Iran, Damavand Trek, Damavand Hike. Lasem esquí de fondo y expedición de snowboard. Senderismo Lasem y esquí de montaña. Senderismo Lasem y visita expedición snowboard. Esquí de montaña Irán. Países Cruz tours esquí. Esquí y Snowboard federación Irán. Ruta Damavand y mapa de los senderos. Esquí de montaña tour de aventura expedición. Esquí de fondo y esquí alpinismo conversaciones y discusiones. Ski montañas de Alborz Irán. Viaje del esquí expedición Irán zona de montaña. Esquí de montaña Alborz y montes Zagros. Visit also Damavand Tour, Damavand Economy Tour. Lasem ski de fond et snowboard expédition. Trekking Lasem et ski de randonnée. Randonnée et visite Lasem snowboard expédition. Ski Alpinisme Iran. Cross country ski visites d'aventure. Ski et snowboard fédération Iran. Damavand itinéraire et carte des sentiers. Ski alpin voyage d'aventure expédition. Ski de randonnée et de ski alpinisme et de pourparlers de discussion. Ski Alborz Mountains Iran. Ski zone touristique de l'expédition l'Iran de montagne. Ski alpinisme Alborz et Monts Zagros. Sci alpinismo e snowboard Lasem spedizione. Trekking Lasem e sci alpinismo. Escursioni Lasem e snowboard tour spedizione. SCI ALPINISMO Iran. Sci di tour e lo sci. Sci e Snowboard Federation Iran. Damavand percorso e Mappa dei sentieri. Sci alpino tour di avventura spedizione. Scialpinismo e sci alpinismo colloqui e discussioni. Ski Alborz Mountains Iran. Ski Tour spedizione Iran zone di montagna. Sci alpinismo Alborz e Monti Zagros. Lasem skiturer og snowboard ekspedisjon. Lasem trekking og ski touring. Lasem fotturer og snowboard ekspedisjon tur. Ski fjellklatring Iran. Langrenn opplevelsesturer. Ski og snowboard forbund Iran. Damavand rute og løypekart. Slalåm opplevelsestur ekspedisjon. Skiturer og ski fjellklatring foredrag og diskusjon. Ski Alborz-fjellene Iran. Ski ekspedisjon tur Iran fjellsonen. Ski fjellklatring Alborz og Zagros. Lasem лыжного туризма и сноуборда экспедиция. Lasem походов и лыжного туризма. Lasem походы и сноуборд экспедиция тур. Альпинизм Иран. Беговые лыжи приключенческие туры. Горные лыжи и сноуборд федерация Иран. Damavand маршрут и след карту. Горные лыжи приключенческий тур экспедиция. Лыжные прогулки и беседы альпинизма лыж и обсуждение. Лыжный Эльбрус горы Ирана. Лыжная экспедиция тур Иран горная зона. Скиальпинизм Alborz и Загрос. All the material on this website is protected by copyright.